The Revive Adserver Project Team have announced that there are now more than 2,500 active installations of Revive Adserver. The graph shows steady growth since the start of the project in September 2013. Each dot represents the number of instances at 1 month intervals since the launch date. 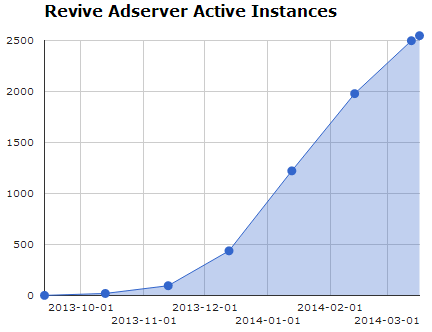 On March 17, a little more than 6 months later, there are now 2,547 active instances of Revive Adserver world wide.